VetPet Box is a subscription for dogs or cats with toys, treats, and other supplies curated by veterinarians. Choose from boxes for petite (up to 15 pounds), small (15-30 pounds), medium (31-50 pounds), large (51-100 pounds) or giant (100+ pounds) and there are also options to select for heavy chewers and dogs with food allergies. This is a review of the large dog box for heavy chewers and dogs with food allergies. My dog, Nyx, is an 87-pound Rottweiler who is definitely a power chewer; she also has inflammatory bowel disease so we avoid pretty much all grains and most animal proteins. Included was an information card with more information about the items in the box. And the last piece of literature was this educational brochure. This time the theme was about safe and calm travel with your dog. I was familiar with this brand because Nyx used to wear Adaptil collars (now I don’t remember why we stopped with those?). This contains dog pheromones and is supposed to help with stress and anxiety. Nyx can’t do much traveling due to her health issues but this will be useful at other times, like when there are loud noises expected or contractors or guests at the house. I don’t find that scented dog waste bags actually do much to cover up the smell of what Nyx leaves behind, but the bags themselves will certainly get used. Plus, the dispenser is nice in cases where you need your hands for something else (like a flashlight at night). This is really long but you cut off the free end to adjust it to the right size for your dog. Then you can push the button and it will light up green or flash green, depending on the setting you choose. You can see Nyx modeling it below. 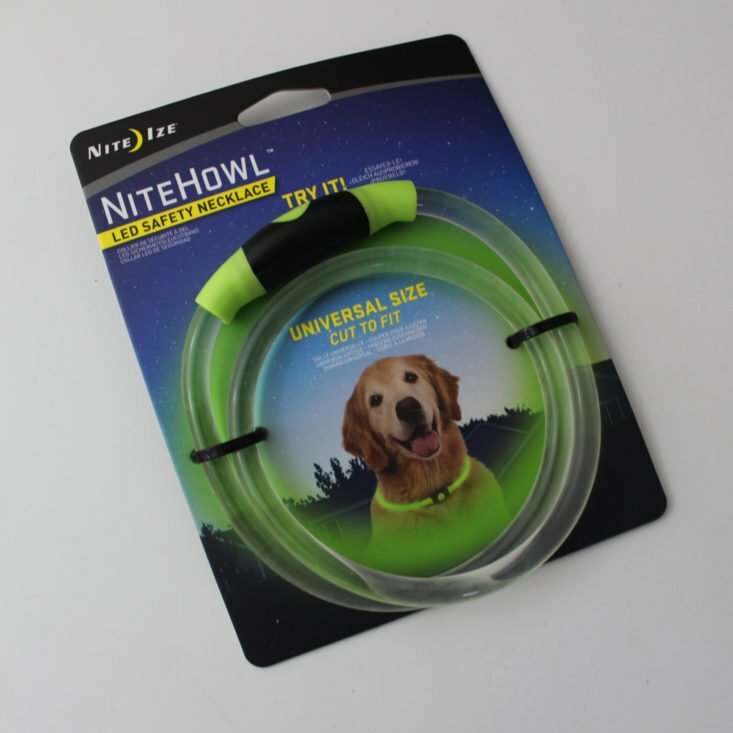 This is handy for a black dog in our neighborhood at night! These are hypoallergenic treats with hydrolyzed (enzymatically digested) soy protein. They do have some oat fiber, but if it is just the fiber, that seems to be OK for Nyx (her IBD responds well to fiber). She liked these pretty well and I think my vet’s office sells them, too (I like to collect a list of small-dollar purchases from the vet because they have a loyalty rewards program if you spend multiples of $100 during a visit and let’s just say, with my pets’ health conditions, we spend a lot there). This is a grain free treat that includes pumpkin, cheddar, and bacon. It has chickpea and potato flour. These are hard cookies and are small enough to work for either large or small dogs. I am going to err on the side of caution and pass these along to someone whose dog can have bacon. However, I can highly recommend this brand – Nyx has safely enjoyed both the pate and crème de menthe treats. This is a nylon toy that comes with five treat rings (you can get more of the same ones if you want), as seen in the first picture. Nyx can’t have these, so I removed them, but I put some other (safe) treats in as shown in the second picture (this was recommended on the packaging of this toy) and she had fun with that too. As it turns out, Nyx was happy just to chew on the bone with no treats as well. Nyx with her new necklace. Nyx *patiently* waiting for one of the Snacker treats. And here are a few shots of her with the bone. Verdict: I calculated a value of $71.23 for August’s Vet Pet Box. That is a little higher than the usual values for this box, actually, and one of the highest I’ve seen for a while. I always find the contents to be of high quality and well-thought-out. We were very excited to see a type of treats Nyx can have and the toy was a success, too. There were also a couple of other handy items that can be used even if you aren’t planning to travel with your dog. Can you still get this box if you sign up today? Due to customization (dog size/chewing habits/dietary issues), boxes may vary from month-to-month. 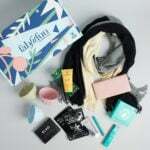 New subscribers typically receive an introductory box first. However, if you’d like to get a repeat of a past box, contact VetPet Box – if your dog has major dental issues, as an example, they want you to be able to get the dental health box and the items within more than once if it will be useful to you. And the same goes for any other theme. What do you think of the August 2018 VetPet Box dog subscription box? Do you subscribe to any dog or cat boxes?